San Diego, July 28th 2015 – The Asthma and Allergy Foundation of America (AAFA) recommends that all Asthma patients have an Asthma Action Plan to help them control symptoms and stay well. The plan is generated from a Personal Peak Flow which is measured by you and your doctor. The Asthma Action Plan is the Asthma patient’s personal guide to help control their asthma, and avoid getting into “trouble”. The plan helps the patient avoid symptoms, as well as enjoy an active lifestyle, attend work/school and exercise – and avoid hospital visits. The use of a “Peak Flow Meter” allows patients to measure their peak flow that day. Symptoms of asthma attacks usually begin to show hours or days before an attack, and the Peak Flow can indicate this. By comparing the peak flow from the meter with the Maximum Personal Flow on the Asthma Action Plan, the patient can know how much of which Asthma medication to take, or what other steps to follow as needed. 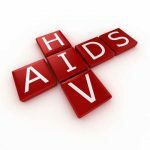 The choice of medication and dosing is decided in conjunction with your physician. 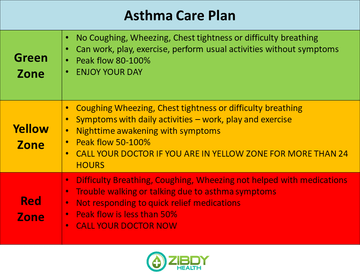 ZibdyHealth now features a built in Asthma Action Plan. Users with asthma can enter a Peak Maximum Flow (as determined with their doctor). 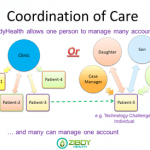 ZibdyHealth then takes over – carrying out the calculations as recommended by the CDC (and AAFA) to create an Asthma Action Plan for that patient. In conjunction with his or her physician, the patient can then input the appropriate medications and dosages for each stage of symptoms added. Users with asthma can then check their Peak Flow each day, and the appropriate section of the Asthma Action Plan will be shown, with the guide to medication and dosage, as well as any activity advice. Gone are the days of spiral notebooks and illegible pen marks. Let ZibdyHealth help you manage and optimize the treatment of your asthma. ZibdyHealth allows users with asthma to record their peak daily flow each day, and medication usage in a convenient manner. The peak flows are recorded in a color coded manner – green for top 20%, yellow for 20-50% and Red for 0-50%– with a date and time stamp. These records can then be reviewed by the user or his or her care provider to look for trends that can be used to optimize the plan. One can update the plan simply by adding a new action plan (after a doctor’s consultation), and ZibdyHealth allows the user (as well as their doctor) to review all past plans. This “longitudinal” data is of excellent help to doctors – and can help identify seasonal patterns that can be used to optimize care even further. ZibdyHealth can help you share your asthma symptoms with your loved ones. Within ZibdyHealth, you can set up associations (with family members or care givers), with whom you can share some or all of your health data. A user with Asthma who maintains an Asthma Action Plan can share this information with any association by granting appropriate permissions for that association. As an example, an elderly parent with Asthma could grant permission to their children and to their care giver. This would provide that patient’s specific Asthma Action Plan – in full detail – to these persons, enabling them monitor this elderly patient appropriately. When this is used in conjunction with the ZibdyHealth School’s feature, it enables school nurses to have this essential information to care for a child suffering from Asthma at school. Asthma often does not exist in isolation, and is often related with other lung or allergic diseases. All of the patient’s other health information – vital signs, allergies, vaccinations, laboratory results, imaging, medications and medical history are ALL vitally important in combination with the action plan. Functions such as medication reminders, interactions warnings and the ability to download/upload Electronic Health Records (CCDs) all work alongside and with the Asthma Action Plan. This makes ZibdyHealth a Complete Smart Personal Health Assistant.